The Pacific Ocean is a vast emptiness, where World War Two was fought on tiny specks of land. 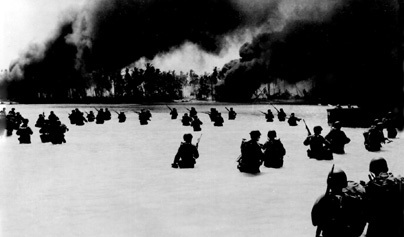 Shootout takes us right into the middle of a daring raid on the Makin Atoll. As the big battles unfold, soldiers come face- to-face at close quarters with their enemies. A solo machine gunner is outnumbered on the island of New Georgia in the Solomons, two dozen Marines find themselves fighting against hundreds of Japanese soldiers on Peleliu and a single rifleman holds off two companies in the Philippines. These are the men with guns in their hands, thousands of miles from home, where the winners of the shootouts, are the only ones left alive. INVESTIGATING HISTORY: Who Killed Crazy Horse?